ARREAZA, Aymara R. “Barcelona: from farewell to welcome”, www.a-desk.org/ 16 april 2018. During the first quarter of 2018, Barcelona has experienced at least two events that signal the urban model to which the city aspires. One is the installation in Montjuïc Castle of the work by Romanian artist Ciprian Homorodean, who has been living in the Catalan capital for almost a decade. The other is the removal of the replica of the commemorative monument to Antonio López, better known as the Marquis of Comillas. The two events are totally at variance, and yet both can be contrasted to reveal the unfolding of the city of the present. While the visitors to the castle are challenged by a sort of labyrinth that traces the message Welcome, the title of the work by Ciprian Homorodean, the statue of the marquis at the bottom end of Via Laietana is taken down from the plinth on which it had stood as a prominent feature in the homonymous square for over a century. I wonder whether we should look for hidden stories in the works mentioned, or whether, on the contrary, the need to open up the debate on the stories endorsed by cities is radically explicit. Let’s take one step at a time, and move from the institutional to the private, from the absence of the Marquis of Comillas in the public square, to the presumed hospitality that brings Ciprian Homorodean to the fore. Antonio López was a controversial character who is still the object of heated discussions. In the mid-nineteenth century he set sail for Cuba from northern Spain to make his living, ambitious for wealth. In 1847 he became an intermediary in the buying and selling of slaves in Cuba. Thirty years before then, England and Spain had signed an agreement abolishing the slave trade, so his enrichment derived from illegal traffic when abolitionist ideas had been around for some time. Besides this summary of his biography, filled with details about lootings and disdain for compliance with the law that tried to curb European dominance over the lives of so many human beings, we should point out that he was awarded the title of marquis for having sent troops to Cuba to stifle the island’s first pro-independence uprisings (1868-1878) and because of his loyalty to the monarchy, as he had received the title of nobility from King Alfonso XII in person. In 1884, Mayor Francisco de Paula Rius i Taulet was responsible for embellishing the city and decided to accept the request made by the López family to erect a posthumous monument to the marquis for his investments in Barcelona and his role promoting the Exposition Universelle of 1888. During the Spanish Civil War, the anarchists knocked down the monument and used the bronze of the sculpture as war material. In 1942 the Franco dictatorship restored the monument to its place in the square that still goes by his name, and sculptor Frederic Marès received the commission of reviving the marquis. 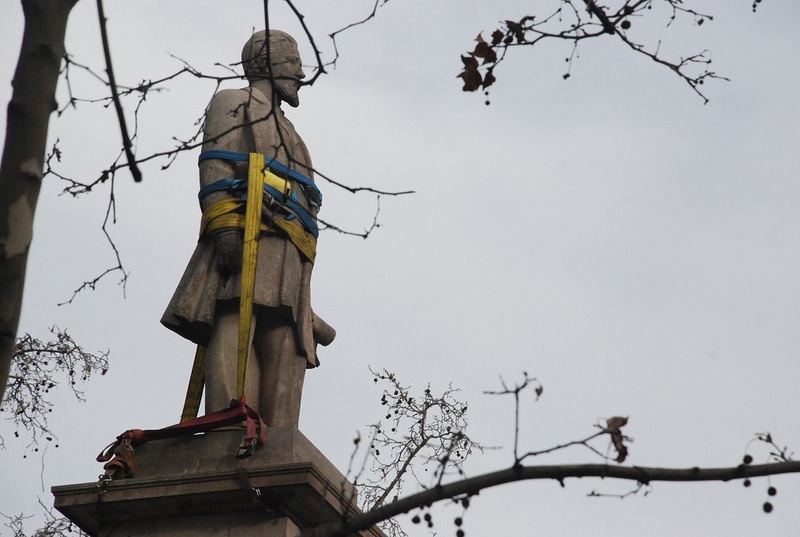 To these two stages in the history we must now add the removal of the bust on the initiative of Barcelona City Council. On 4 March last, the sculpture of the slave trader was bidden farewell and withdrawn from public space, leaving behind the pedestal, like a memorial with no figure but with a base. The successive comings and goings of this monument reveal an obvious dispute regarding such symbolic creations, the impositions of their replacements, and ephemeral iconoclasms. In 2014 the group show entitled Nonuments presented Monumento derribado (Demolished Monument) by Domènec, a work about the demolition of the statue of General Prim by the Libertarian Youth in 1936. Ironically, the artist suggested ‘reinstating’ the demolished monument in Ciutadella Park, leaving in its place the sculpture’s empty pedestal. According to Domènec, Monumento derribado deals with the problematic connections between event, commemoration, monument and city. Something similar could have been done with the monument to Antonio López, twice erected and twice knocked down. Instead of denying the historical account, during the recent transfer of the sculpture to the Collections Centre of the Museu d’Història de la Ciutat de Barcelona (MuHBA) information lecterns were placed on one side of the square explaining who the Marquis of Comillas was and what he did. A slight change in meaning, a reinterpretation of sorts is suggested, although we are still only halfway there. We need to acknowledge the connections with the colony on the other side of the Atlantic and the transfer of capitals that enabled Barcelona to grow during the second half of the nineteenth century. The creation of meanings verging on decolonisation implies the creation of new ideologies that include other stories, but first of all the damage suffered has to be accepted. The dismantling of the statue entailed taking responsibility for the questioning and being exposed to criticism without contributing to new obscurantisms. 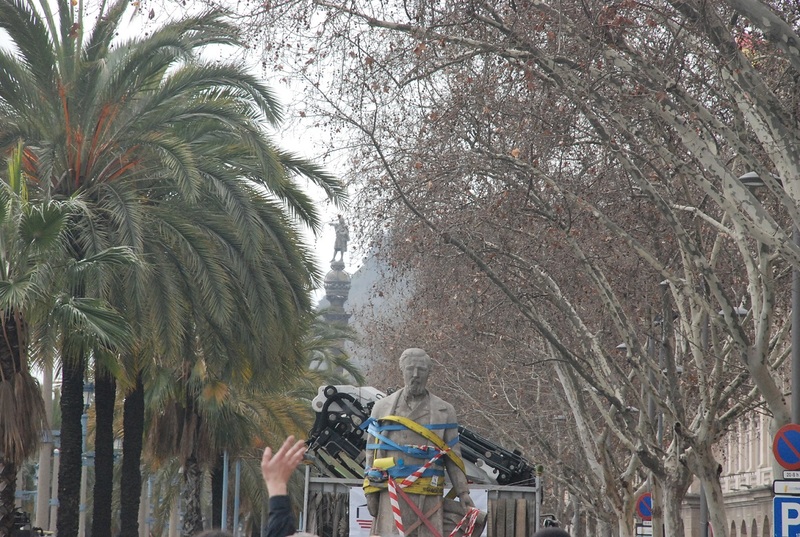 The incident of 4 March – a Sunday hot chocolate party with tumblers and people crying ‘Farewell, Antonio’ – was caricature-like, almost disrespectful before the transcendence implied by the removal of the statue of such a controversial figure. The symbolic battles fought in the city are indeed visible. They are executed with gestures such as the Farewell on Via Laietana and the Welcome displayed by Ciprian Homorodean in the parade ground of Montjuïc Castle, in which he reflects on refuge and solidarity policies in the Catalan capital and in Europe. The colonial foundations that evoke the slavish past and the nets he uses to surround the fort of Montjuïc are indebted to otherness. If in the nineteenth century colonies were the backyard of the metropolis and of ‘the capital of capital’, as historian Martín Rodrigo called nineteenth-century Barcelona, in the twenty-first century foreigners, refugees, immigrants and even tourists should receive a more hospitable and less neo-colonial treatment by the city’s various institutional, civilian and political actors. Welcome derived from the feelings aroused by the erection of walls in different countries around the world and from concerns with the refugee crisis, but also from worries caused by the graffiti in several neighbourhoods of Barcelona reading in English ‘Tourists Go Home’. The Romanian artist observes a current tendency towards self-absorption, which he considers a very dangerous phenomenon. 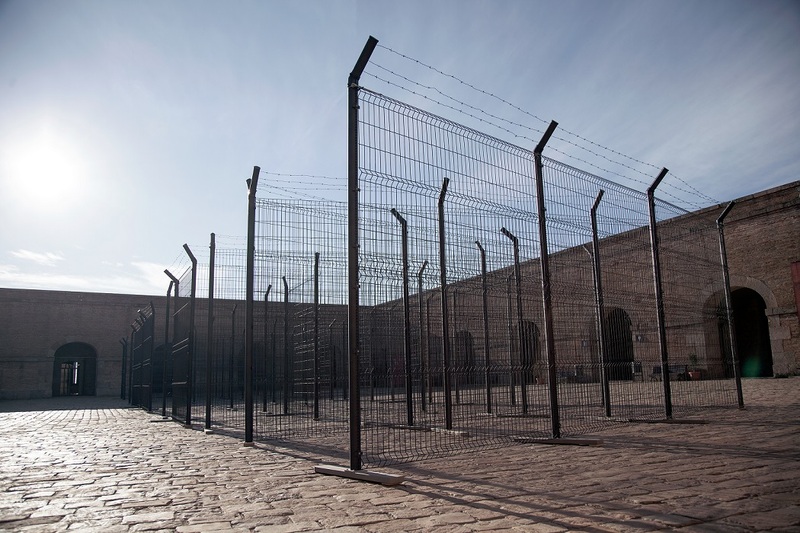 While the word Welcome written in huge letters and materialised in metal fences and barbed wire as a labyrinth that evokes a border, a prison or a refugee camp evokes a number of meanings, the welcoming message (addressed to whom?) contains the paradox that Barcelona receives refugees with limitations and under rigorous control. This site-specific piece plays with the sense of hospitality while the structure, in perfect dialogue with the site, recalls the condition of surveillance and insurmountable control of the panopticon. The piece is poles apart from the humorous works in Homorodean’s career. The serious tone of the sculpture reveals policies filled with good intentions that are, however, weakly executed, drawing attention to the basic rules governing multicultural societies such as Catalonia. The lines of action of the Romanian artist often challenge audiences, and Welcome invites visitors to compare different forms of refuge, without red carpets or back doors, focusing on hospitality as a value that urgently needs to be shared, so that the piece manages to overcome obstacles and move towards the essence of the human. If one thing is clear from these events it’s that Barcelona is currently deliberating between welcoming and bidding farewell, but in order to be released from tensions the city must address its past, with all its blemishes, and try to avoid repeating old mistakes. It’s not only necessary to revise the urban stories that have been woven since the days of the colony, but to intertwine counterbalancing memories that enable us to move forward with fewer monuments and greater acceptance of history and hence of the critical present to which we all belong.